A romantic drama, Pride And Prejudice explores classism, the social role of women, and the often thin line between love and hate. In the late 18th century, the Bennets are a lower-middle class family in rural England, fretting about marrying-off their five daughters. 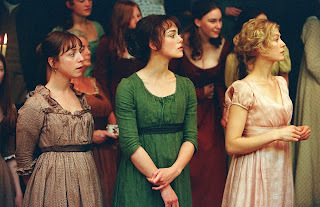 Mr. and Mrs. Bennet (Donald Sutherland and Brenda Blethyn) try to maintain order in the household, where their daughter Jane (Rosamund Pike) is the most beautiful among the girls, while Lizzie (Keira Knightley) is spirited and independent minded. 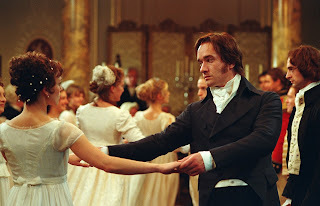 The village goes abuzz when news filters in that wealthy and jovial bachelor Mr. Bingley (Simon Woods) has move into a nearby estate, along with his equally eligible good friend Mr. Darcy (Matthew Macfadyen). In a series of balls and social interactions Bingley and Jane appear to be falling in love, while Lizzie and the arrogant Darcy immediately clash and repulse each other. Class divisions and plenty of interference from others will get in the way of happiness for the Bennet girls. Joe Wright's feature film directorial debut is also, surprisingly, the first big screen adaptation of Jane Austen's classic novel since 1940. The 2005 version features lush production values, a pragmatic, muddy and cluttered aesthetic celebrating the Bennet's working class status (although no character in the story ever seems to worry about work) and admirable use of outside locations and filtered sunshine. Regardless, this remains a remake of a well-worn story, and the fresh ingredients carry limited effectiveness. Pride And Prejudice is a reminder of how recently women were primarily treated as burdensome creatures to be married off to the first available man and at the earliest opportunity. Within the quiet wisdom of Mr. Bennett and Lizzie's fiery independence the film hints at changes to come, but overall this is world where men are a coveted prize and a woman's status is defined by the male that she can attract. Other than the sparring between Lizzie and Darcy, falling in love consists of a couple of dances together, here beautifully constructed by Wright using remarkably fluid camerawork. Meaningful conversations between men and women do not exist, and this may be a good thing. In the world of Pride And Prejudice, the men are various combinations of shifty, manipulative, ugly, opportunistic and dishonorable, or as in the case of Bingley, happily vacuous. The wealthy but charmless Mr. Collins (Tom Hollander) and the dashing but vaguely disconcerting Wickham (Rupert Friend) contribute to the shallow pool. The performances are bright and stay on the right side of the cinematic divide. Wright tones down Austen's over-elaborate prose, giving the characters welcome grounding and allowing his actors room to manoeuver. Keira Knightley benefits from Lizzie's modern sensibilities to shine as a woman who shall speak her mind and never compromise her values. The other characters are more opaque and less singular, with Rosamund Pike and Matthew Macfadyen erring on the side of too sedate. Judi Dench is over-the-top (in terms of makeup, hair, and performance) in a couple of scenes as Lady Catherine de Bourgh, helping to keep the Bennet girls in their place. Pride And Prejudice is lovely to look at but stuck in time and place, with little to excite modern sensibilities.